Recipe Time: Mushroom And Pinto Bean Veggie Burgers. People love using mushrooms as a meat replacement because once they are cooked they provide a similar a taste and texture. This recipe uses mushrooms and pinto beans as the base of the burger and all can be said and done in 30 minutes or less. 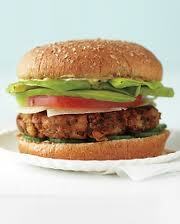 There are 200 calories per veggie burger, 8 grams of protein, 6 grams of fiber, they are gluten- free and vegan as well. Mushroom And Pinto Bean Veggie Burgers. 1 1/2 Green Onions, Diced. 1/4 Cup Fresh Mushrooms, Diced. 4 Tablespoons Of Olive Oil For Frying. – Saute the onions and garlic in olive oil for 3-5 minutes, until the onions are soft. – Add the green onions, cumin and mushrooms and cook for 5 minutes, until mushrooms are cooked. Set aside. – Drain the beans and mash them with a fork or process in a food processor until well mashed. – Add the mushrooms to the beans as well as the parsley, salt and pepper. Stir until well combined. – Shape the mixture into 2 patties and heat the olive oil in a non stick skillet. – Cook each side for 3-4 minutes and serve immediately.